Dope stuff by the 3MG. Single tracks from each of them. Japan blows up!!! We should all go there. Quietstorm on the 1's and 2's so check it out. 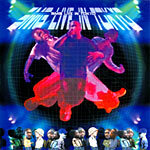 Live recorded in Liquid Room on 2-12-2000 'World Famous 9'.